I love the random things that often happen in my job. This is the sort of email that you answer straight away. I was expecting some posters (and would have been happy to get them). So it was no surprise when a heavy plastic tube was delivered a few days later. I think you’ll agree that its contents was a little better than a batch of movie posters. The letter that it came with it tells me that ILM had this backdrop made up for an interview with Dennis Muren. 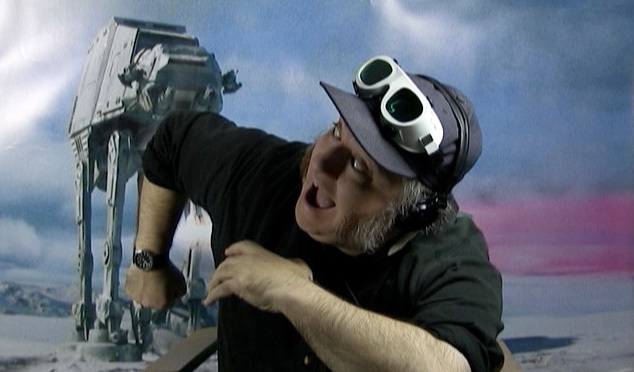 You know: nine-time Oscar-winning visual effects artist and the SFX director of “Empire Strikes Back.” I started unrolling it and it just kept right on going and going and going. And the dopey grin on my face got bigger and bigger and bigger. Why, I felt like I could take on the Empire all by myself. One nagging problem: how the hell was I going to hang this? Just measuring it out was tricky. I used a half a dozen soda cans to flatten it out and came up with a measurement that was a little off. Finally, I cleared some furniture from my living room so I could come at it from all angles with my tape measure, and I got it exactly: 90″ by 40″. I snapped a photo and sent it to a friend. He was much, much more impressed by it when he did a double-take and realized that he’d gotten the scale wrong: those were soda cans and not D-cell batteries. Clearly I couldn’t just swing by the craft store for an off-the-shelf frame. I wound up putting together a simple half-tenon support frame for it, envisioning that a box of jumbo bulldog clips (with some padding in their jaws) would hold it up nicely while I figure out a more permanent solution. For now, it’s clipped to the frame and supported by a couple of plastic grocery baskets. It isn’t exactly a Lucasfilm Archives-quality display. But then again, the original item was certainly never meant to be revered. It’s printed on heavy poster paper and has a few holes in the corner where it was pinned to its original wall behind Mr. Muren. It was made to suit a purpose and I’m just very lucky and grateful that it happened to be cluttering up someone’s office and that this person was kind enough to send it over. I have a newfound admiration for not only your decorating, but also tag selection skills. That is one impressive array of metadata, to go along with the impressive backdrop. Loved the garden backdrop which was beautiful in summer, but when you do “Macbreak Weekly” now you are in darkness half way through! I am very impressed that in the second picture the Walker is facing right…..
Andy, do it the same way trade shows hang them. Velcro, and then make a frame out of either 1x or conduit. Clearly you are not married! I can’t wait to see it in action on MacBreak Weekly. I was watching ‘live’ last week and my window was darkening just about at the same rate as yours. There’s a store on Bent St in Cambridge. Thought the new Santa Sleigh background that the Elves came up with was impressive (see web address below) … For support try the art supply store for canvas stretcher bars …they have mitered corners which slip together … You didn’t say what it is painted on but since it was rolled you might want to add upright or two … Now, the question is: just why do you look as though you belong in front of it ??!?? So, two things. 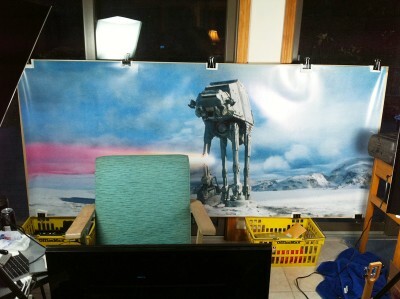 Will you name the Imperial Walker “Skype” and have you thought of two carefully mounted laser pointers projecting through two pinholes at the ends of the gun turrets? …you’ll see a picture of me. Just spit up all over my keyboard. Thanks, Andy; thanks a ton. And may I point out that the backdrop is perfectly seasonal, as we head toward the winter months? Now all you need is an Endor backdrop for spring, a Tattooine desert backdrop for summer, and maybe a Dagobah backdrop for fall? Your intro on Macbreak Weekly made my week. I nearly spat my brew on my iPad. You have the best bon mots (not sure if that is correct grammar)(best, good words?). That’s about the coolest (in a very cool/geeky way) thing I’ve seen since a long time ago in a galaxy…(you know the rest). Awesome.